I have a thing for banana in baked goods—any baked goods. Cookies, cake, muffins, quickbread, blondies, you name it. I’ve always loved bananas, and it’s possible that I like them even more when they’re folded into a bowl of batter. This old-fashioned vegan banana cake with creamy cashew frosting is my newest favorite, a happy marriage of traditional banana bread and something lighter, fluffier, and a little more festive. The idea for a banana cake like this was originally inspired by an old Ina Garten recipe, the old-fashioned banana cake in How Easy is That? I loved the idea, but at the time, I didn’t have much savvy in veganizing recipes that weren’t very vegan to begin with. Since I’ve been flexing my muscles as a baker much more in the last few years, I have a better sense of how to use a non-vegan recipe as inspiration for my own baked good, and I’m having a lot of fun with the process. The cake itself is pretty simple. I tried it a few ways, and my favorite version ended up using vegan yogurt to help create moisture and to serve as an egg replacer. Any plain vegan yogurt is fine—I used almond milk yogurt, but soy, cashew, or coconut will all work nicely. The cashew frosting will definitely add some sweetness to the recipe, but it’s sweetened with maple or agave, and I find that it’s not cloying the way a buttercream frostings can be. If you’d like your snack cake to be more like snack and less like a formal dessert, you can skip the frosting altogether. I thought that adding some nuts would be a nice way to give a bit of crunch and texture to an otherwise very moist and soft dessert. Chopped walnuts, pecans, pistachios, or almonds would all be fine here! My local health food store has these maple walnuts that I love—they’re sweet but not too sweet, perfect for putting into oatmeal or snacking—and I used them. If you have a homemade recipe for vegan candied nuts that you’re into, that would work really well, too. You could also finish the cake with a sprinkling of toasted coconut. To prepare the frosting, place the cashews, syrup, non-dairy milk or water, salt, and extract in a high-speed blender or food processor. Blend or process until the mixture is mostly smooth; in a high-speed blender, this will be about 2 minutes once you get to high speed, and in a food processor it should take about 4 minutes, with a few breaks to scrape the bowl down. Then, with the machine running, drizzle in the coconut oil. Continue blending till the frosting is smooth and emulsified. Transfer it to an airtight container to chill for at least 2 hours. It will keep in the fridge for up to 4 days. Preheat your oven to 350F. Grease and flour a 9-inch, springform cake pan (I like to place a piece of round parchment in the bottom as well, to prevent any chance of the cake sticking). Sift the flour into a large mixing bowl, then stir it together with the salt, baking soda, baking powder, and sugar. In a separate mixing bowl, stir together the banana, yogurt, oil, non-dairy milk, lemon, and vanilla. Add these wet ingredients to the dry ingredients and fold them together until the batter is evenly mixed and no flour remains at the bottom. A few lumps in the batter is OK. Transfer the cake to the oven and bake for 35-40 minutes, or until the top is golden and firm to the touch and a toothpick inserted into the center emerges clean (depending on your oven, it could take up to 45-50 minutes, but I recommend checking it after 35 minutes to see how far along the cake is). Remove the cake from the oven and the springform pan, then allow it to cool completely before frosting. Frost the cake, reserving any extra frosting for dipping pieces of fresh fruit, or for another frosted treat. Sprinkle the cake with the nuts, then slice and serve. *You can also use your favorite gluten-free, all purpose flour combination. I always think of fall as baking season, a time when it’s finally cool enough to turn the oven on and greet the change in seasons with the smell of spices and sweets. This cake isn’t spiced like a lot of autumnal treats are—you’ll taste banana and vanilla most of all—which makes it a nice, all-purpose cake for any season. I hope you’ll like it as much as I have. And I’ll see you this weekend for the weekly roundup. 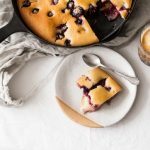 sounds delicious- and the photos are so beautiful! I’ll take a slice of this with a cup of tea this afternoon please ;). I actually have scribbled somewhere in my notes “eat more banana cake” with step one being: make a banana cake. Making my dreams come true lady. This looks so good Gena! This looks absolutely amazing, and, I’ve gotta say, it’s maybe the prettiest banana bread I’ve ever seen. MUST try this one out! this is stored in the fridge after frosting I am guessing? also any advice if I want to make cupcakes out of this recipe instead of a cake? Sizo, you can keep it at room temperature for about a day, and the fridge after that. I think it could easily make cupcakes, but probably closer to 10 than to a dozen! 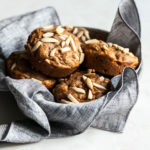 This is the closest recipe I have found to recreating the not too sweet, slightly dense tea cakes I remember my mom making when I was growing up. So far it has been the perfect dessert, and I can tell it will be great for breakfast and snacks as well. I didn’t make the frosting but I did add walnuts to the batter. Thank you for this, it is definitely going to have a place in my baking rotation. I’m so glad you’re enjoying it, Anya! Wow looks delicious – I’ll have to make this banana bread. I always have so many over-ripe bananas in my freezer! I just love banana cake and this recioe sounds beaut. I learnt this trick where you store over ripe bananas in the freezer for use in banana cakes and muffins. Just defrost priir to use. Works a treat as the banana is mushy ready for use in the cake. Saves a few dollars as well and I’m all for ‘waste not want not’. Thanks for this recipe. Looks delish! I just made this cake and it didn’t rise as high as it appears in your photo. Baking soda and powder used were not outdated… did I do something wrong? I’m sorry to hear that! Did you use the lemon juice? It’s also possible it had something to do with oven heat, the age or brand of flour, etc. I’m not sure, but I hope the taste was good in any case! Hello, how could I replace yogurt?